CSAT360 is firmly committed to your privacy. This Privacy Statement discloses our information gathering and dissemination practices. 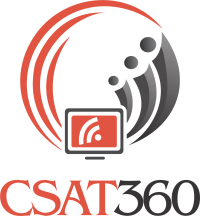 Using csattotal.com does not require registration of any kind other than voluntary registration for Newsletters, White papers, and registration to conferences organized by CSAT360. The personal data collected will not be sold to anyone outside and will be solely used by CSAT360 for a one-on-one contact with the registrants. Any information that we have collected or stored about you may be transferred to a future purchaser of our company and/or its assets. The data collected is stored in a secure server with our ISP which will take periodic backups of it but will not give or sell them to anyone. This website contains links to other websites. CSAT360 is not responsible for the privacy practices or the contents of such websites, nor do we take any responsibility for the opinions of third parties expressed on or through our website. This site gives users the following option for removing their information from our database to not receive future communications or to no longer receive our service: To delete your record from our database, send us an email at content@csat360.com. This site gives users the following option for changing and modifying information previously provided: Send email to content@csat360.com to request a change.